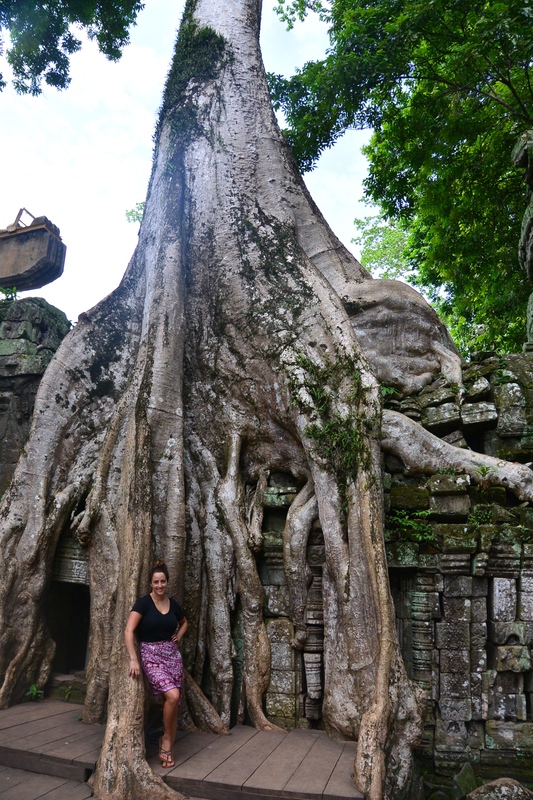 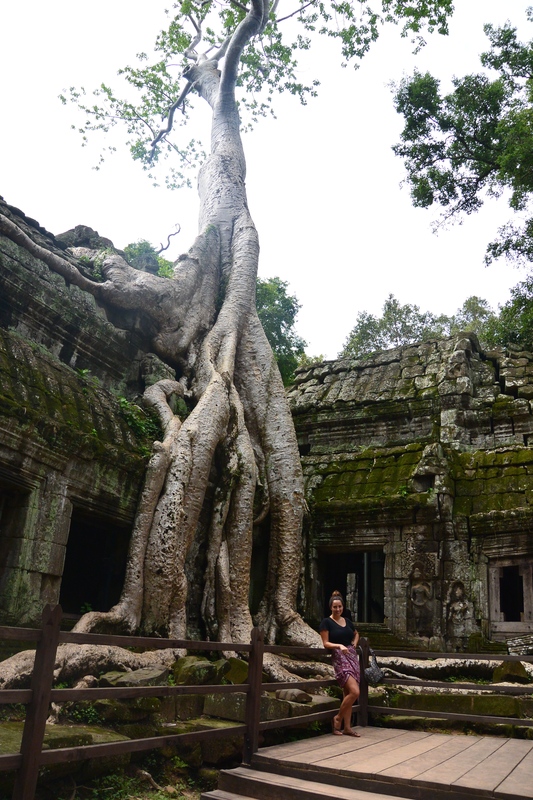 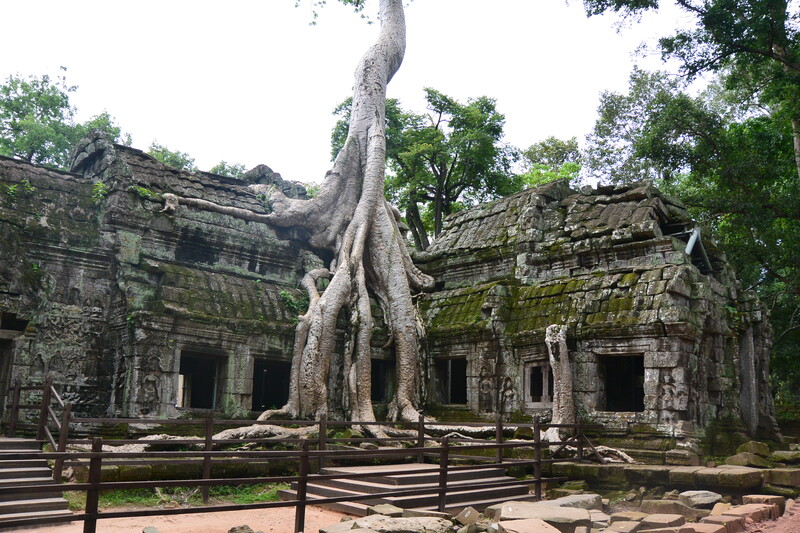 My favourite temple out of all of the ones we saw at Angkor was Ta Prohm (and we saw a lot). 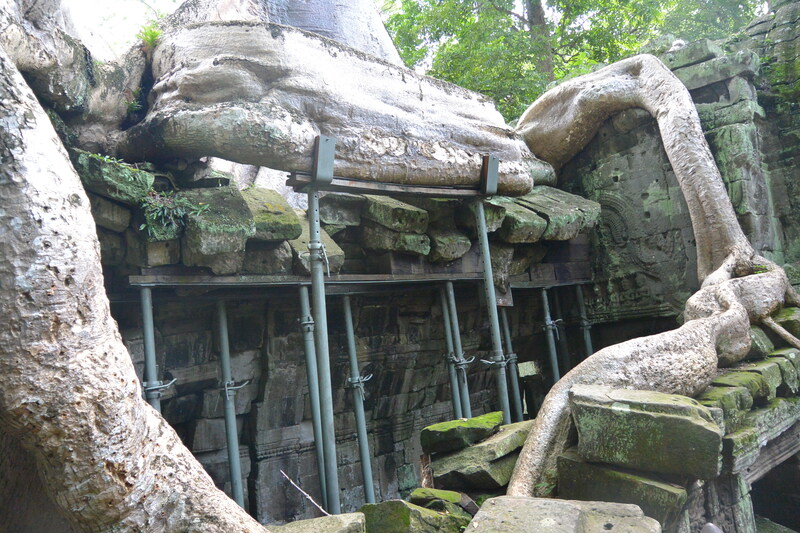 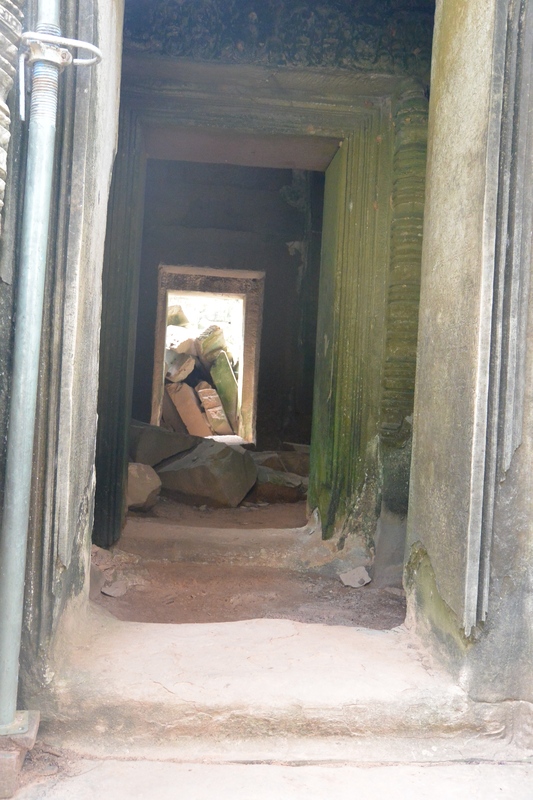 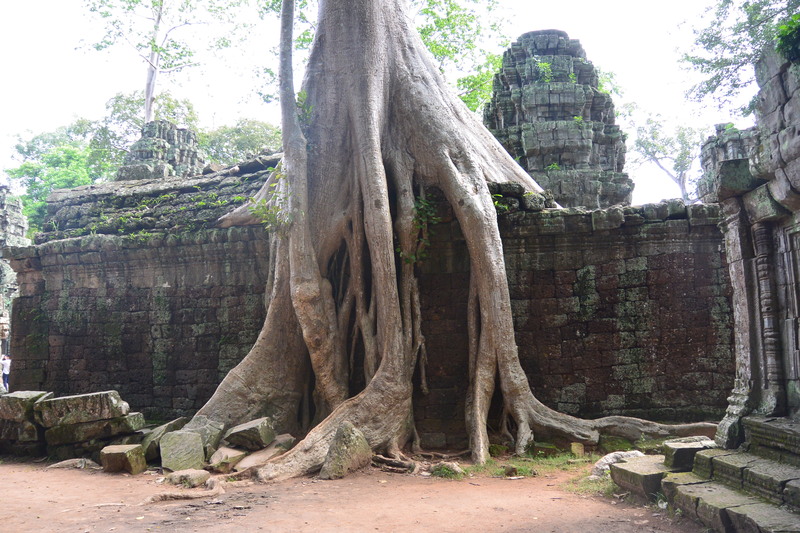 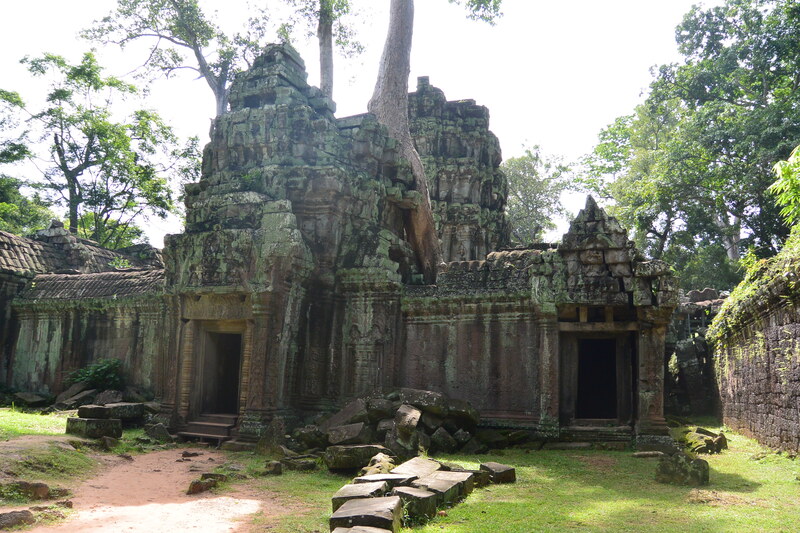 Many of the temples at Angkor looked like Ta Prohm when it was rediscovered, and massive restoration was done to the temples to get them back to as close as possible to how they were originally, and to make it safe for people to visit them. 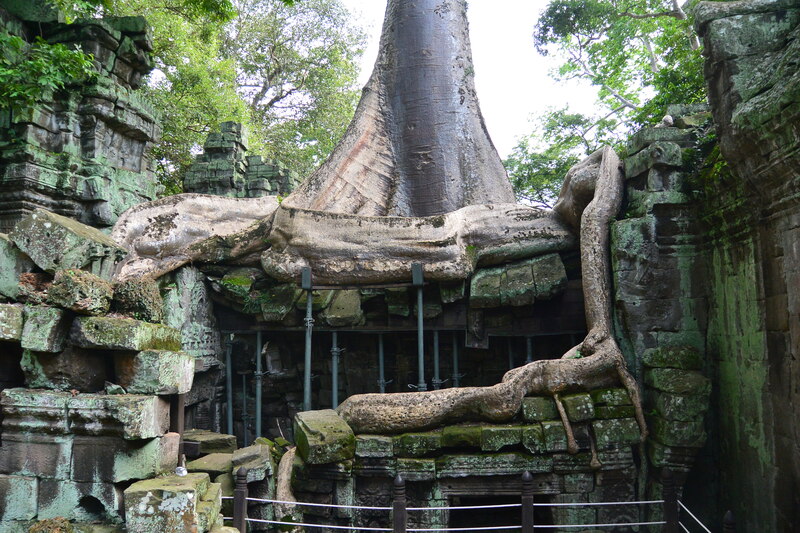 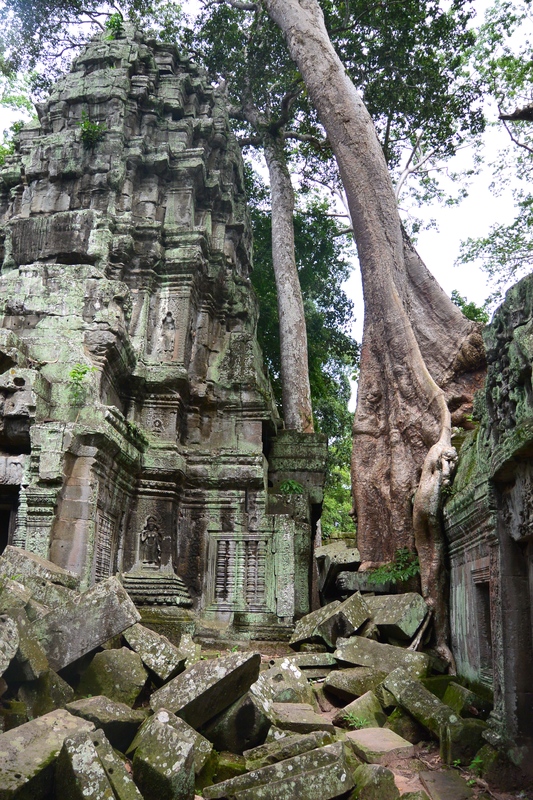 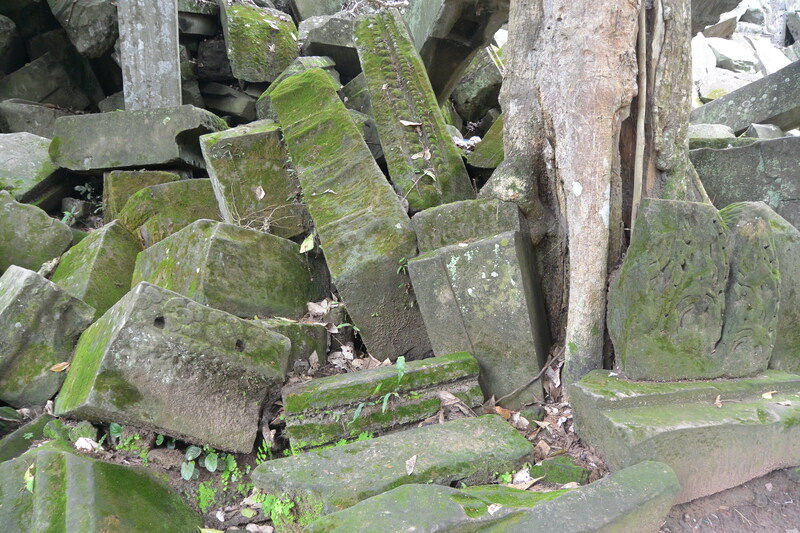 Ta Prohm was not restored the same way, it was left as it was found to give people an idea of what the other temples had looked like after so many years of neglect, when the jungle grew around and through the temples because nobody was there to stop it. 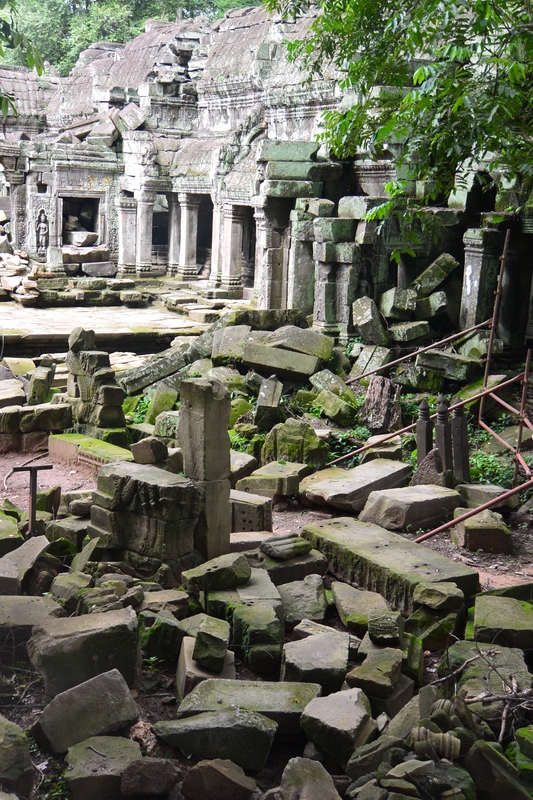 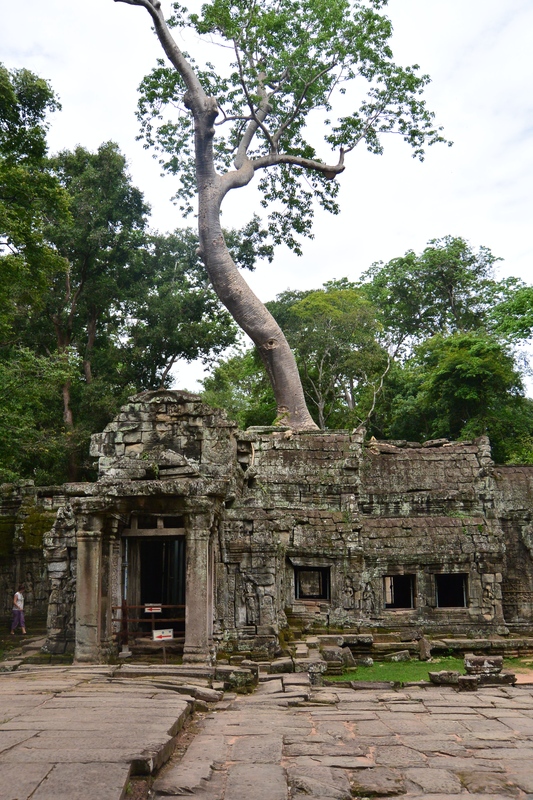 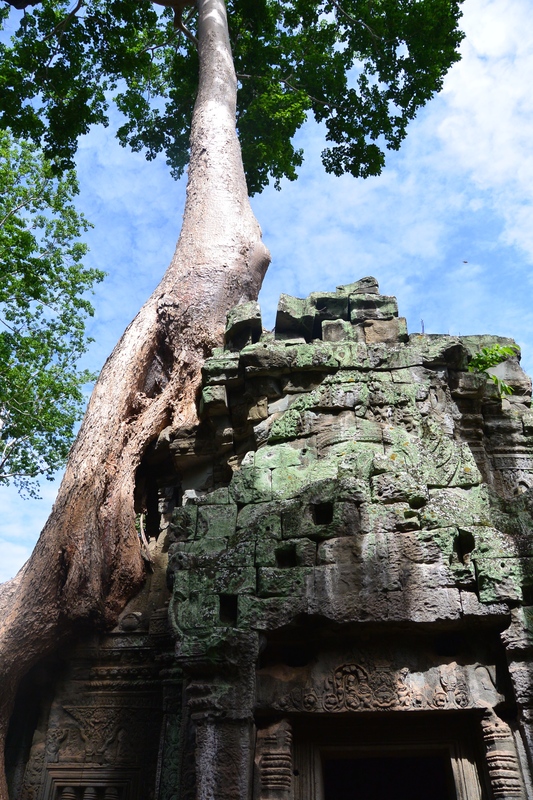 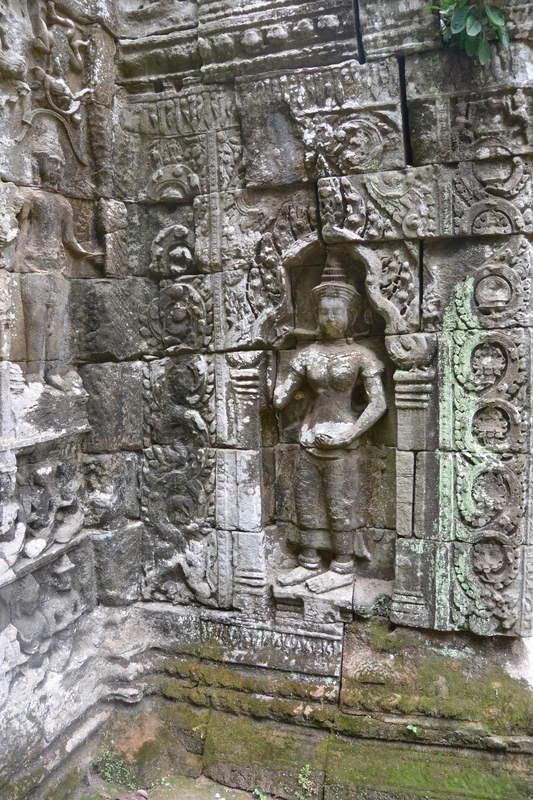 Some parts of Ta Prohm have been minimally restored, in order to make it safe for people to come in and visit, but mostly it’s just as it was found. 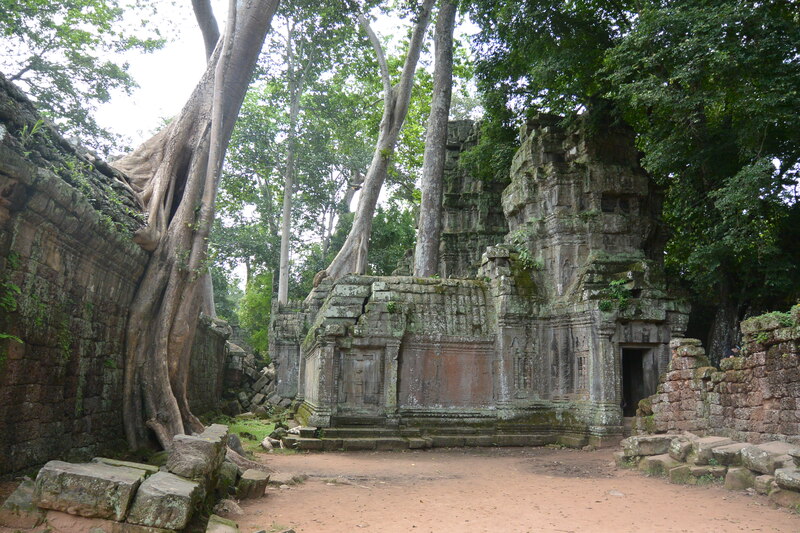 It is so, so gorgeous in there. 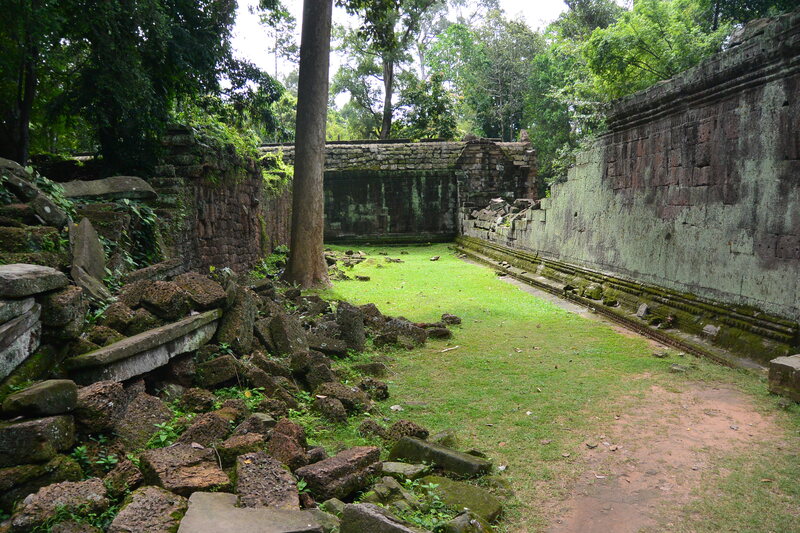 It’s so green and peaceful, and you feel like you are discovering an ancient civilization. 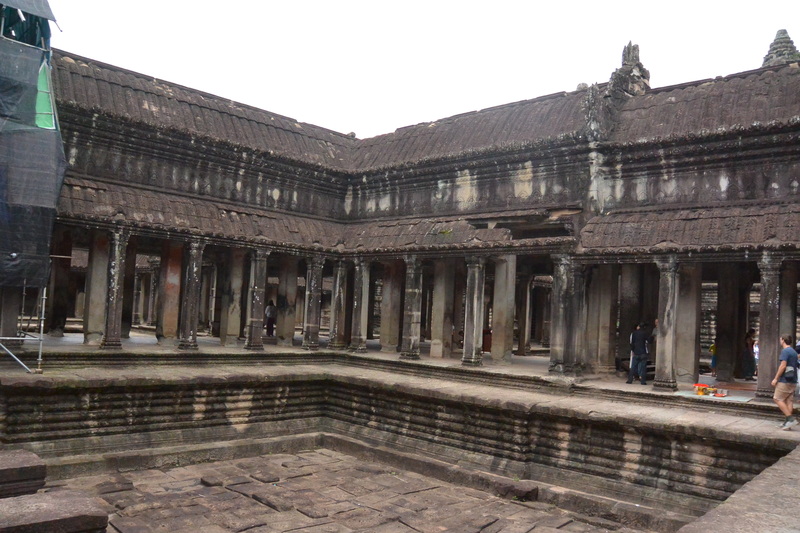 It’s very, very serene, and so beautiful. 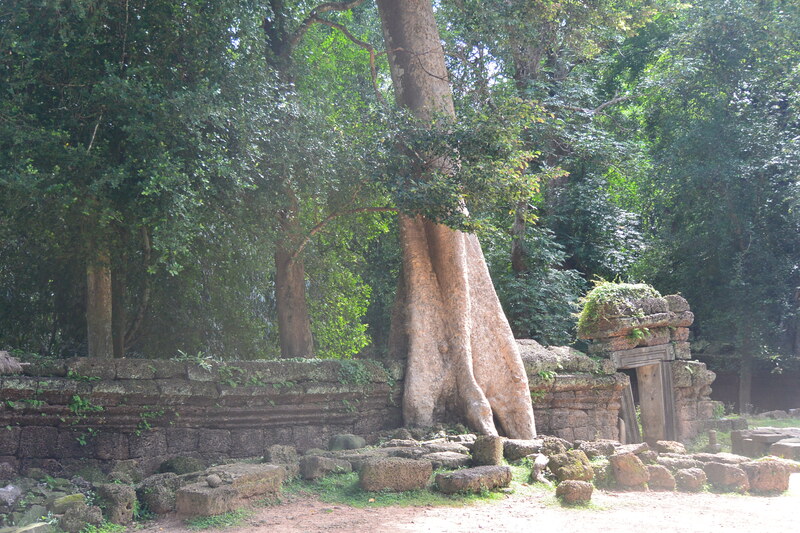 It even manages to maintain that serenity when there are bus loads of tourists coming in to see it. 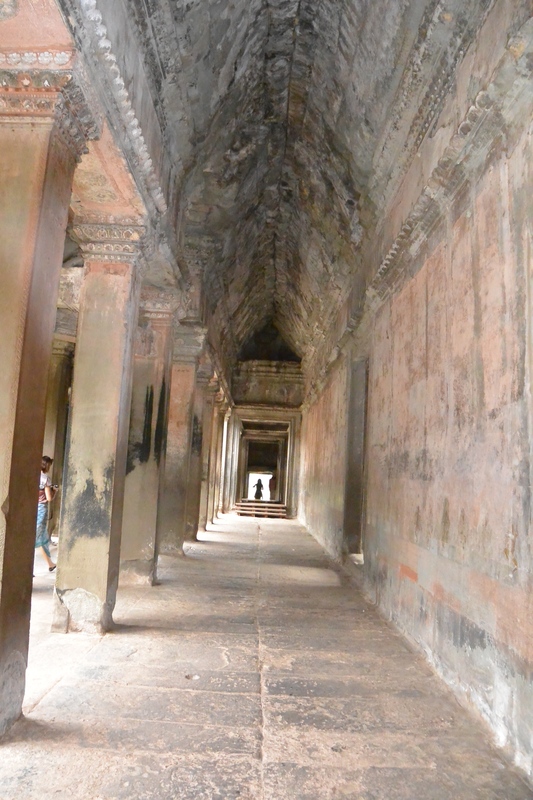 Ideally, everyone would get to see it with as few other people as possible, but it doesn’t alway work out that way. 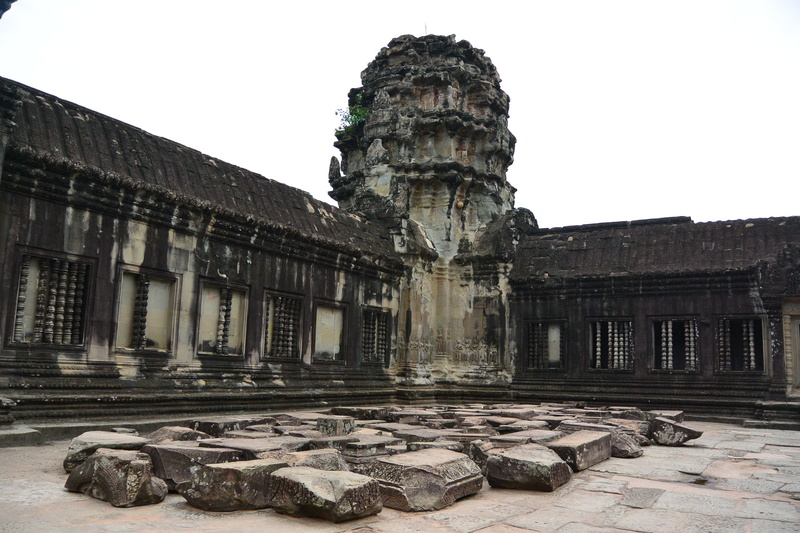 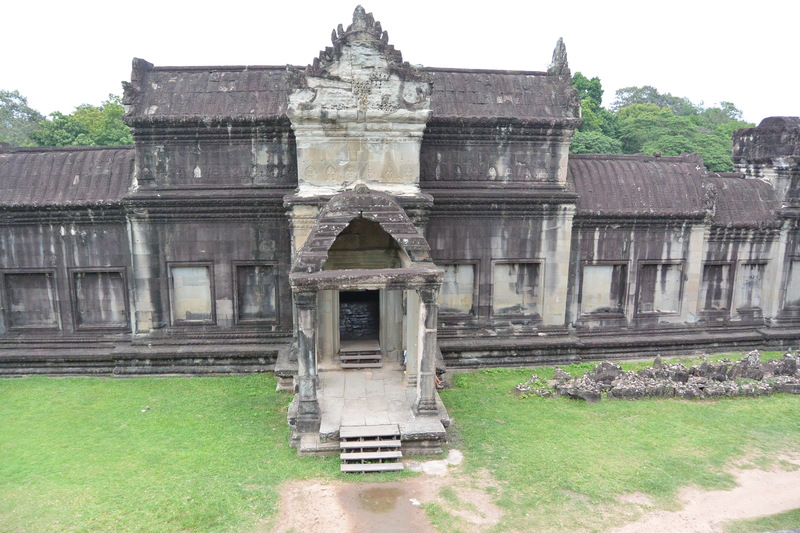 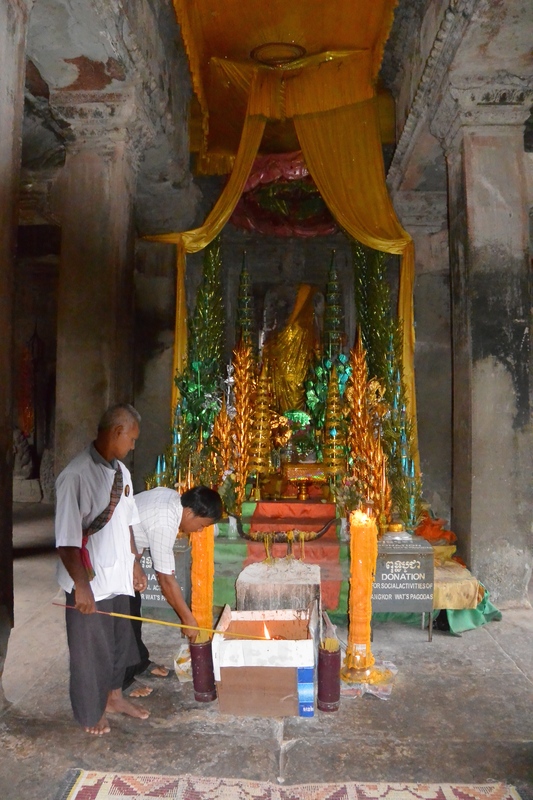 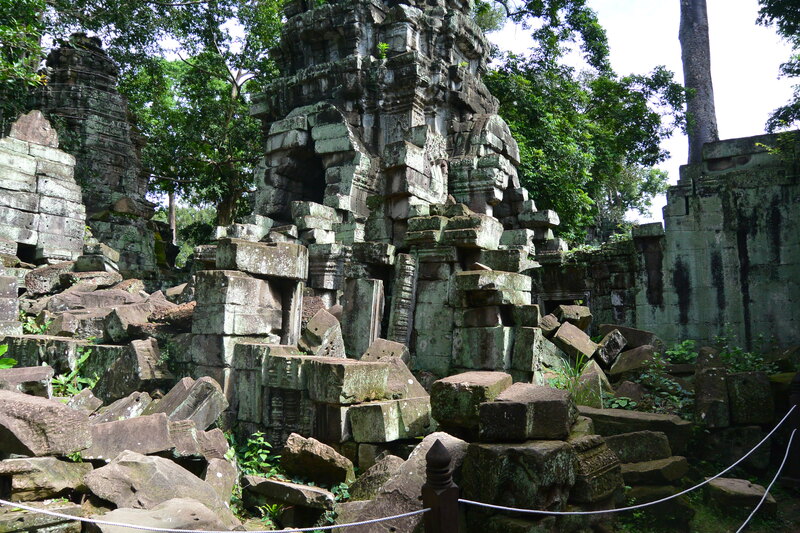 The best tip I can give for this, is to go first thing in the morning, when everyone else is at Angkor Wat, and then go back and visit Angkor Wat when everyone else has moved on to other temples. 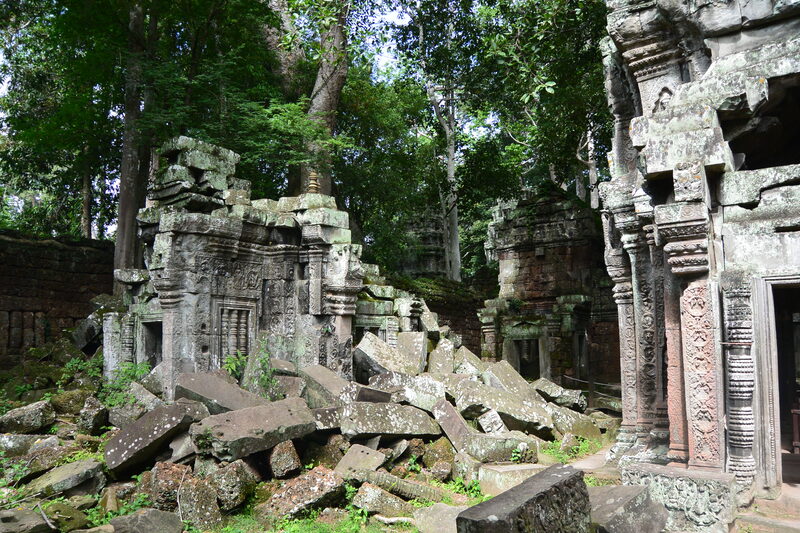 I truly loved the time I spent here, seeing the massive trees growing up through the piles of rubble, and everything is this amazing shade of green. 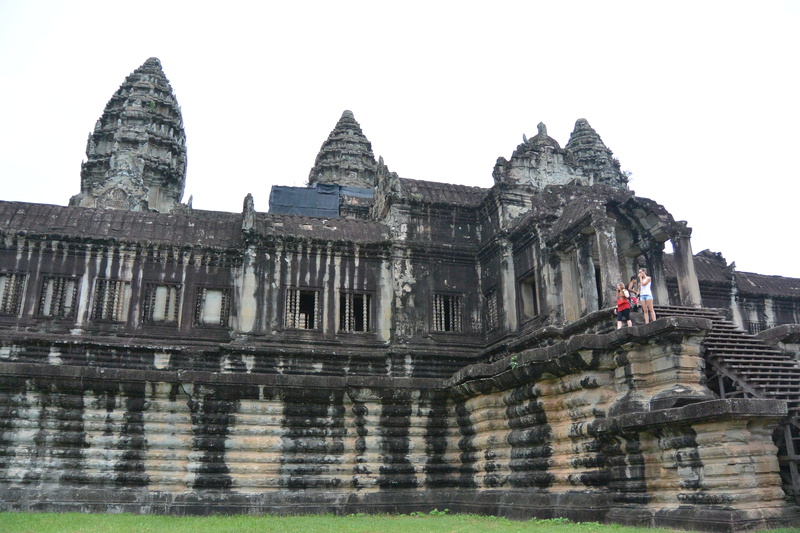 It’s a very special place, and I’m so glad I was able to see it first hand. 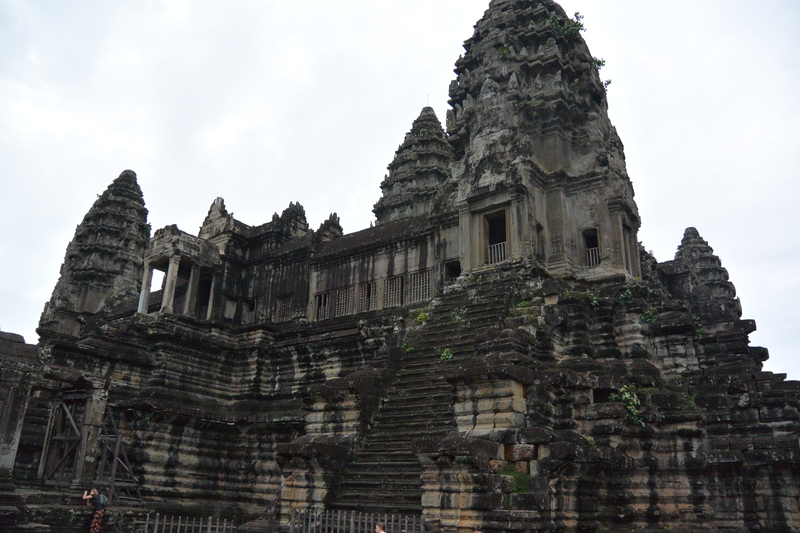 A lot of the places we’ve seen on our trip so far have been amazing, but one of the ones I was was looking forward to the most was Angkor Wat, mostly because it’s somewhere I never thought I’d be able to go. 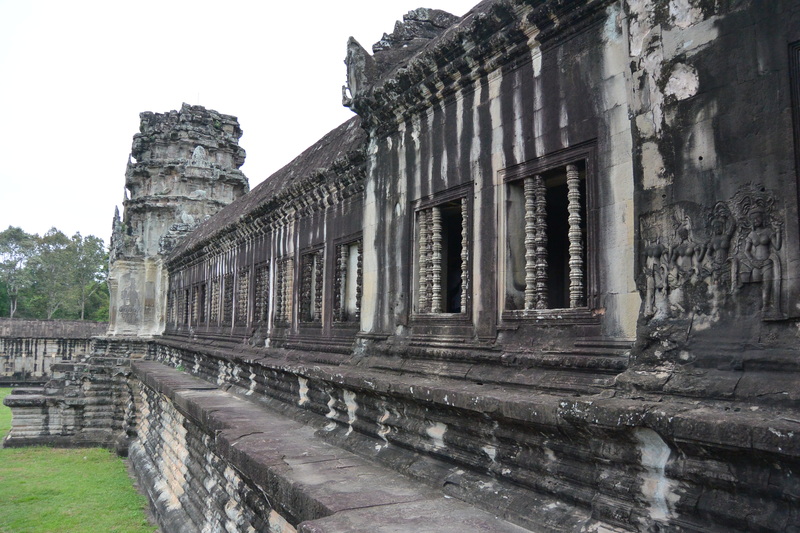 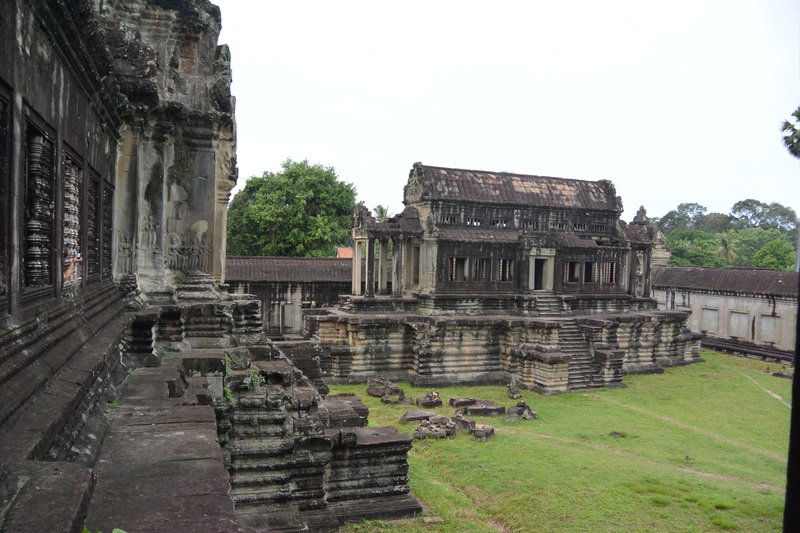 The first time I ever heard of Angkor Wat, I was sixteen, in my social studies class. 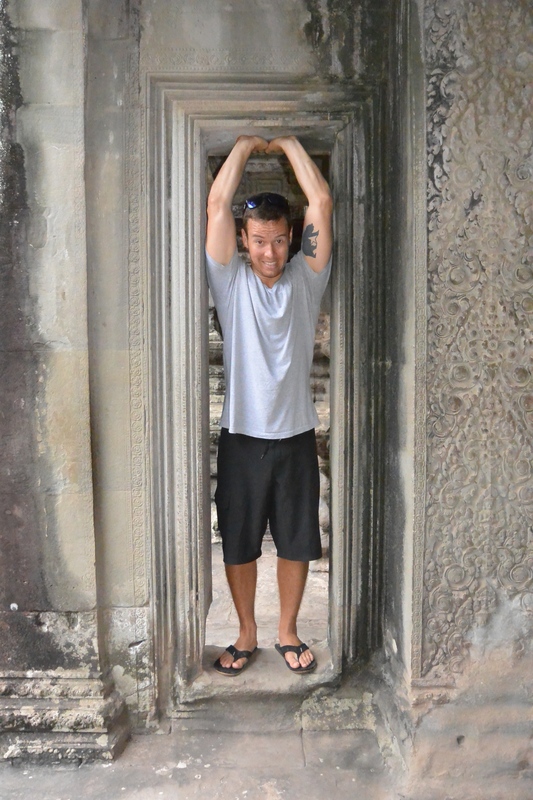 I don’t even remember what the context was, or why we were talking about it, but I was instantly interested. 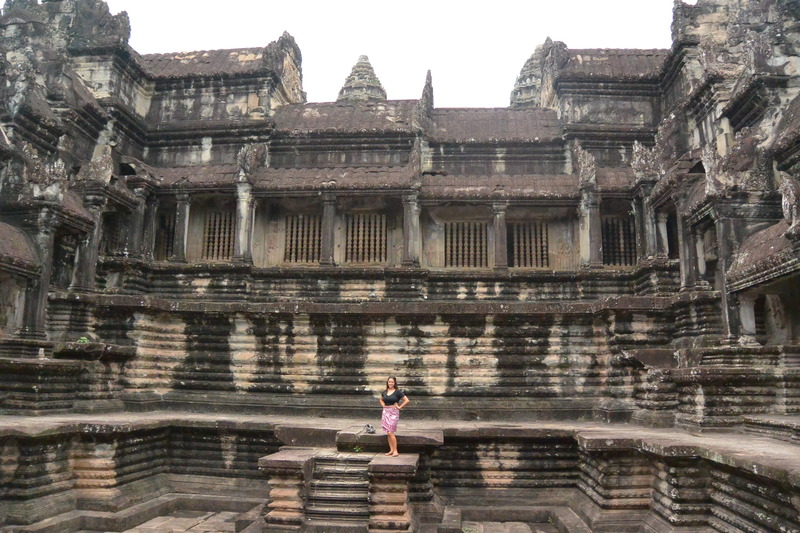 I remember hoping that one day I would make it there, but at the same time, I figured it was very unlikely, since I was just a kid from a small town in Saskatchewan. 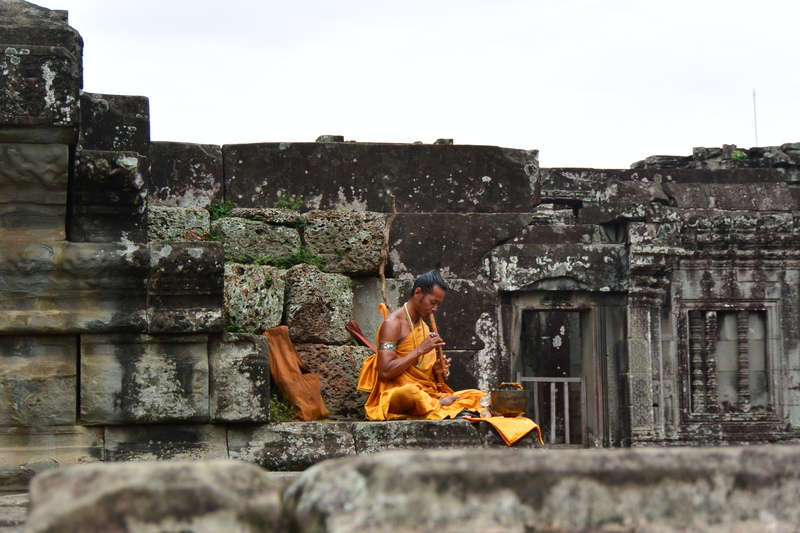 The world seemed infinite to me then, and I didn’t even know anybody that knew anyone who had ever been to Cambodia. 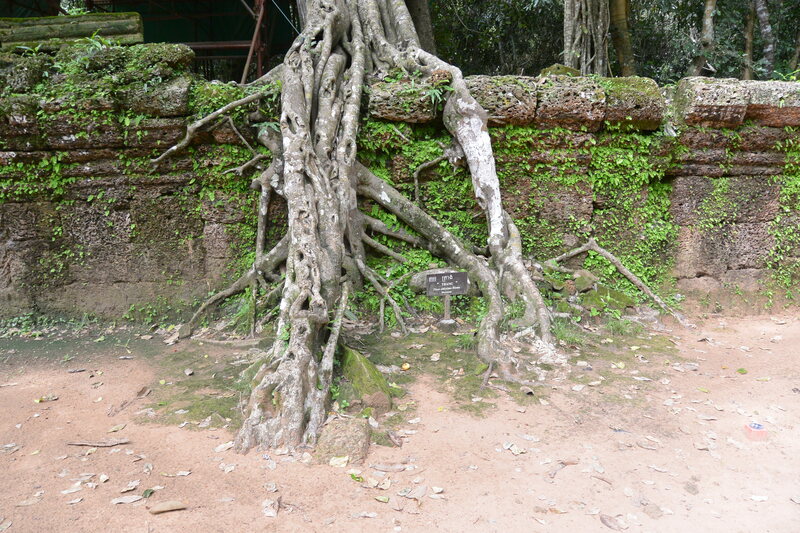 The next summer, I found a book called First Born by Doris Mortmain at my grandma’s house. 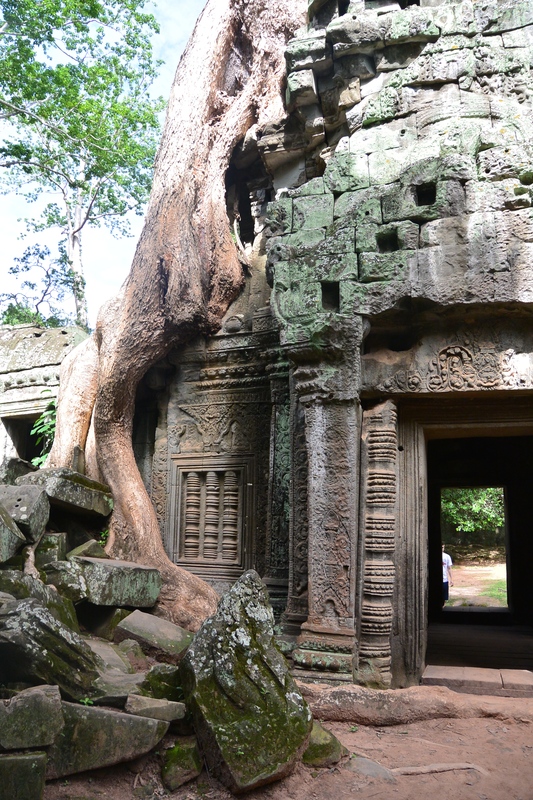 It was completely ridiculous, but it is still one of my favourite books ever. 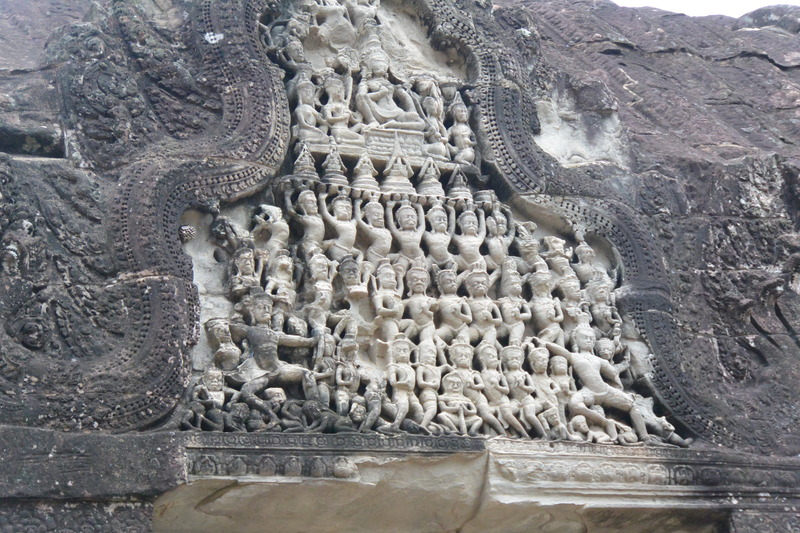 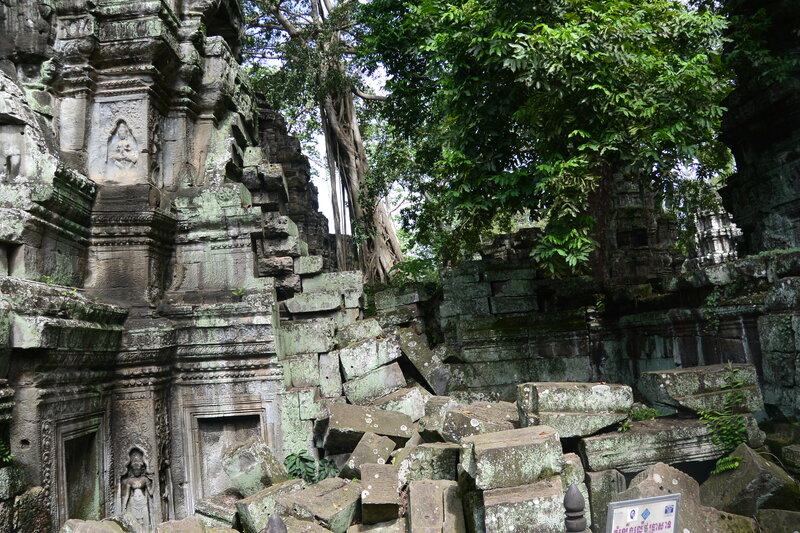 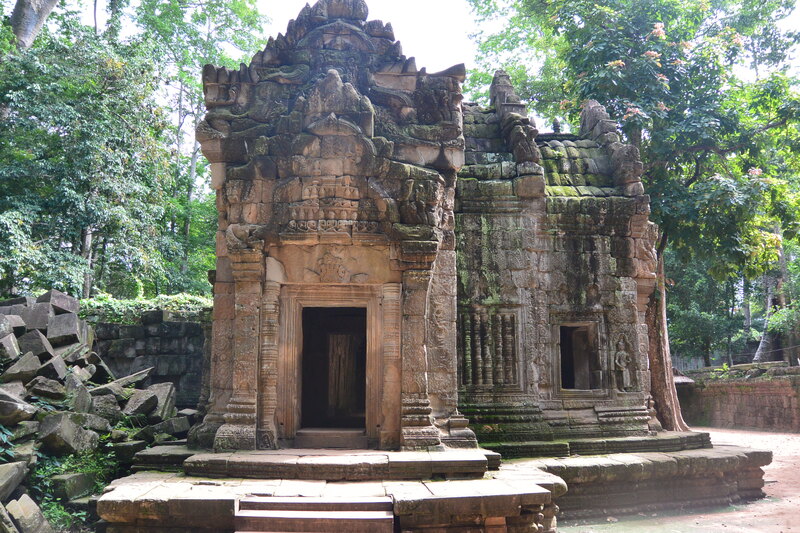 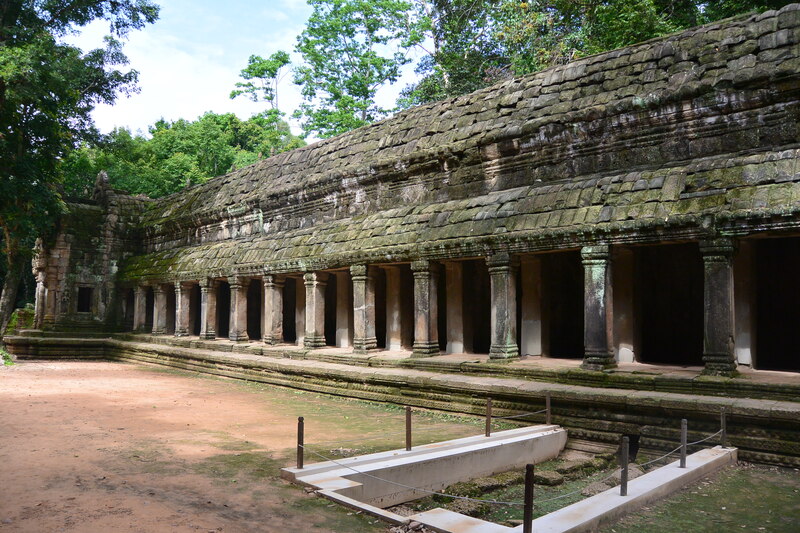 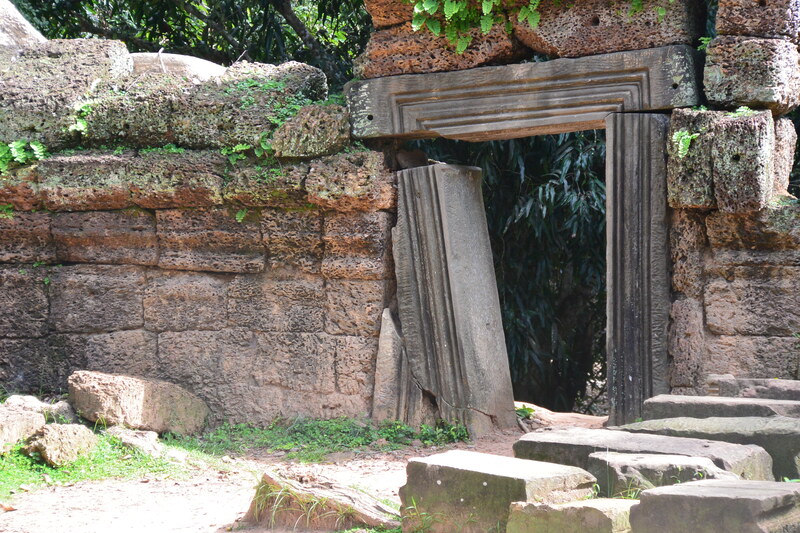 In one scene, the author describes the two characters having a picnic at a beautiful ruined temple in the middle of the jungle in Cambodia. 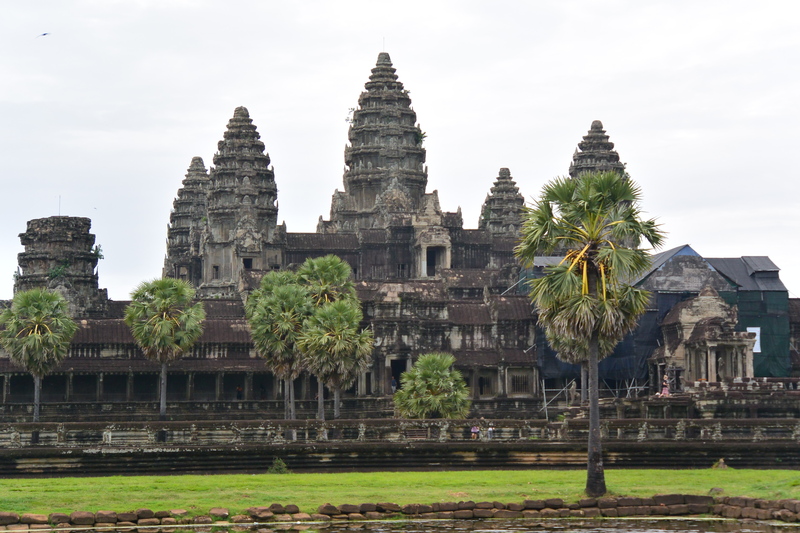 The book takes places in the 1960’s and 1970’s and she never names the place outright, but I knew it was Angkor Wat, and it made me want to visit even more. 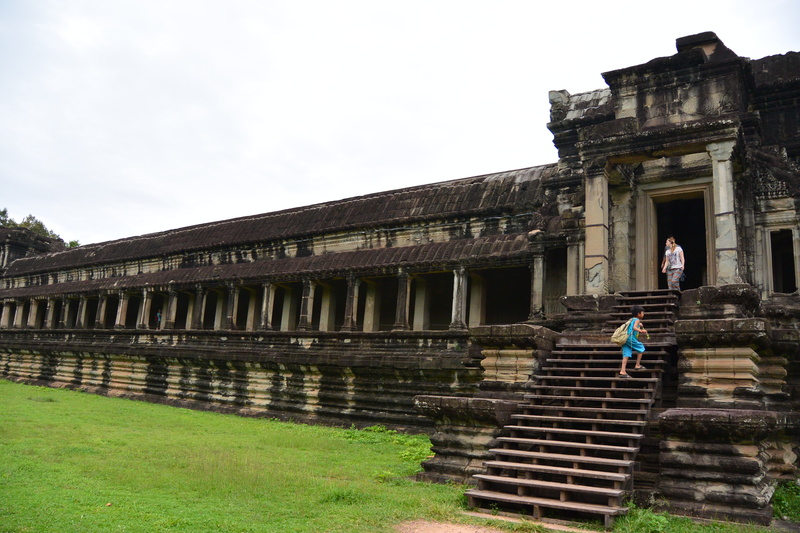 I always thought Angkor Wat was beautiful, but I was also fascinated with the history, it was built a thousand years ago, and was all but forgotten about (by the outside world, locals knew about it, obviously) until Cambodia was colonized by the French in the 1800’s. 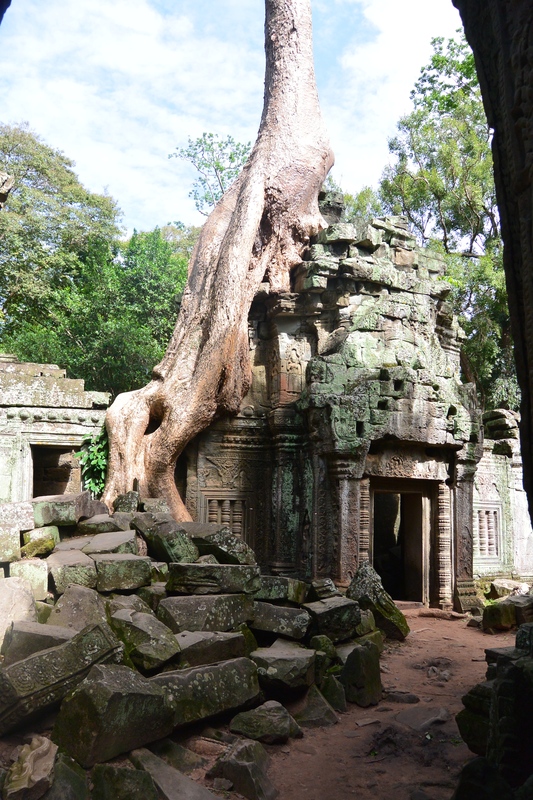 I always wondered what the first people who stumbled upon it were thinking, one minute they are chopping through jungle trees, the next minute they are faced with this enormous, amazing structure that nobody knew was there. 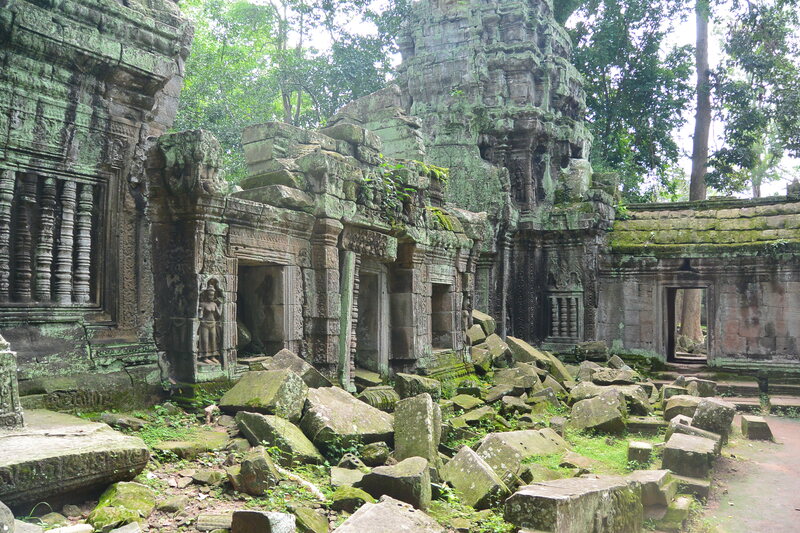 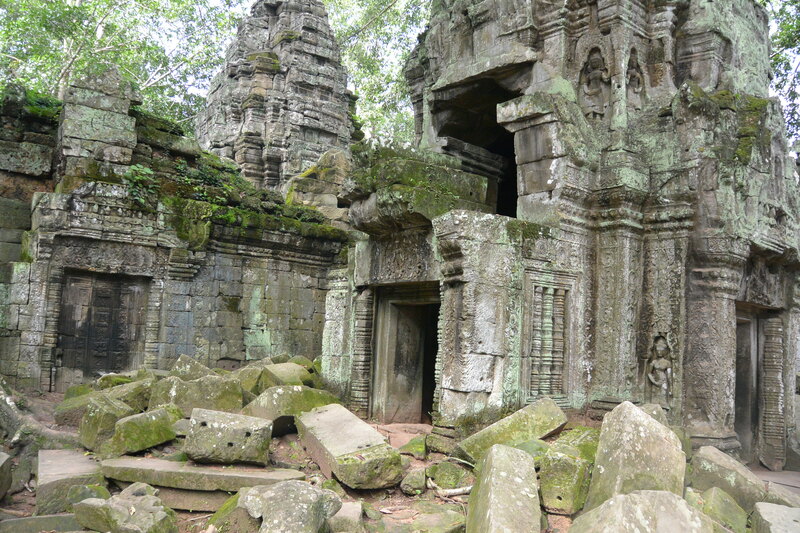 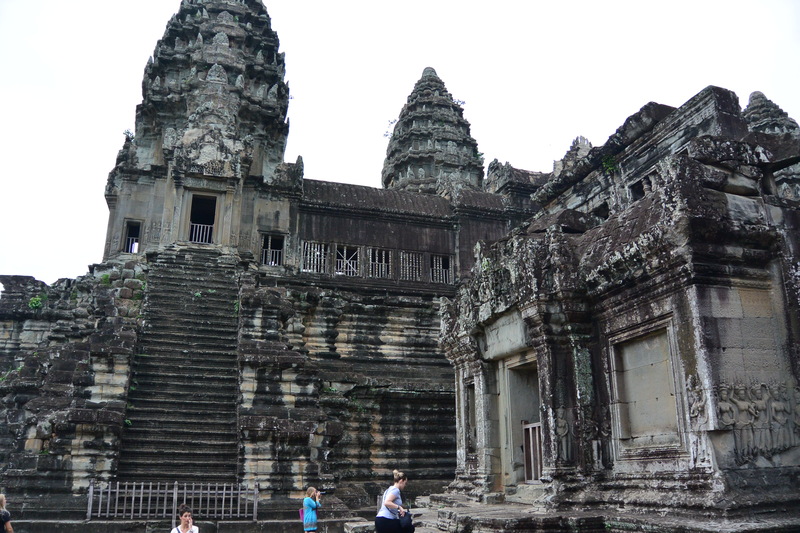 It’s certainly not undiscovered anymore, millions of people visit Angkor each year. 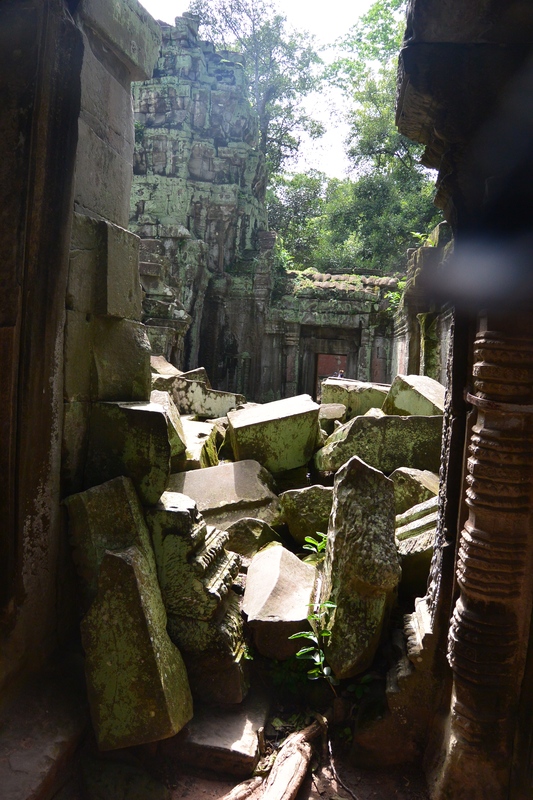 It’s only been reopened to tourists since the early 90’s, and the number of visitors has been increasing ever since, but even though it no longer feels like a forgotten place, it’s still pretty amazing. 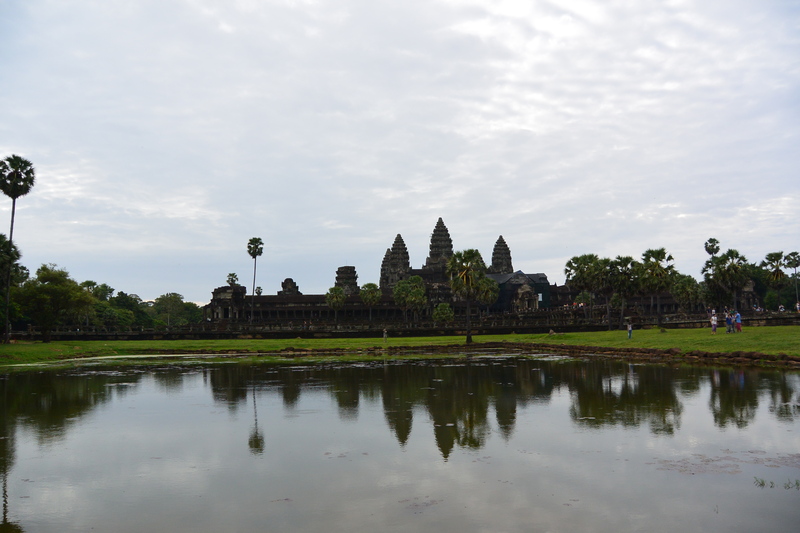 We got up early to visit Angkor Wat at sunrise, I’d read somewhere that if you get there super early, it’s quiet and you can even get some of the temples to yourself sometimes. 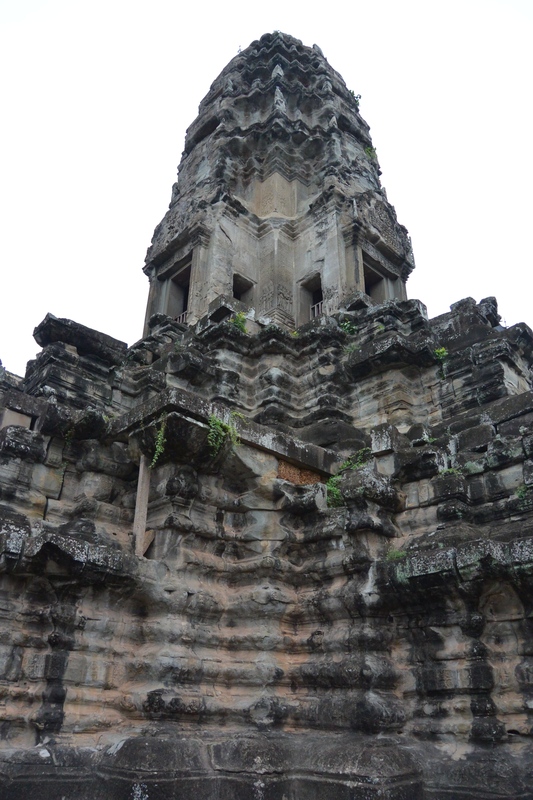 That was not my experience at all, there were at least a few thousand people there when we got there at 5:30 in the morning. 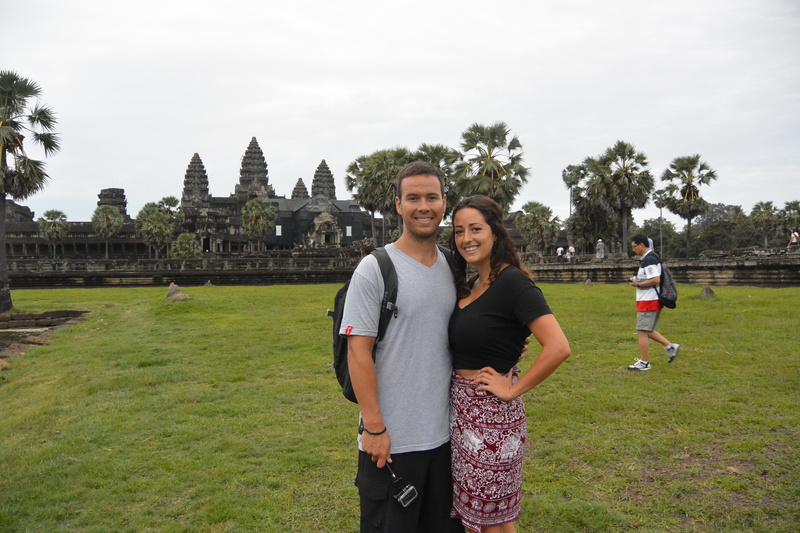 I’ve seen amazing pictures of Angkor Wat at sunrise, so if you have the opportunity to go, definitely do it, unfortunately for us, it was really grey the day we went, and we couldn’t see the sky at all behind the clouds. 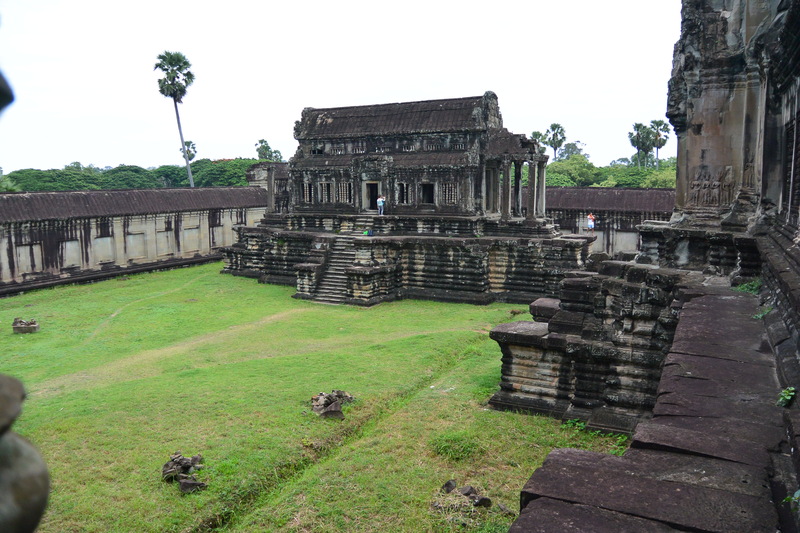 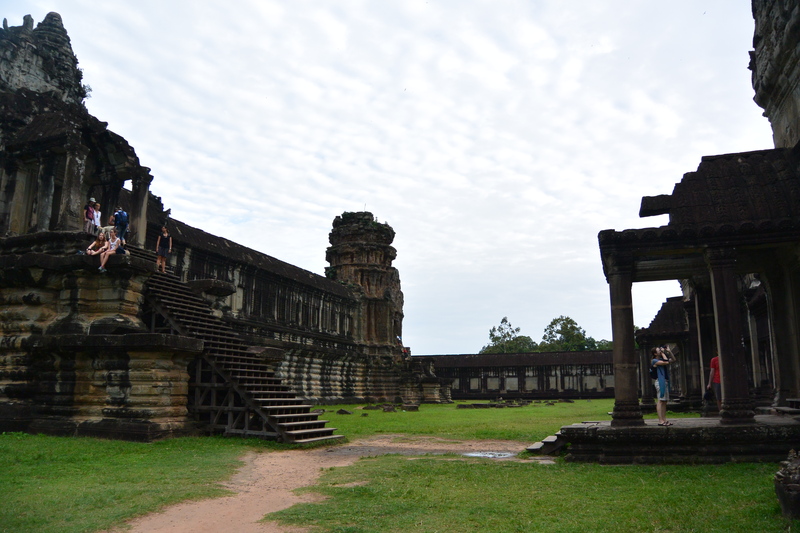 Even though it was pretty busy when we got there, Angkor Wat is pretty massive and there are lots of different areas to explore, so by the time we made it to the courtyard at the very back, there were hardly any other people around. 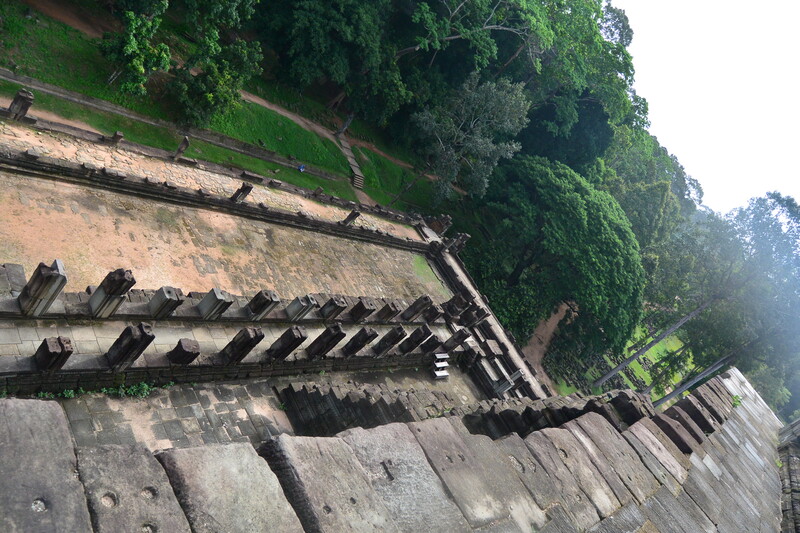 It was really peaceful there, and we just saw on a ledge and hung out for a bit, while I tried to convince myself that I was actually really there. 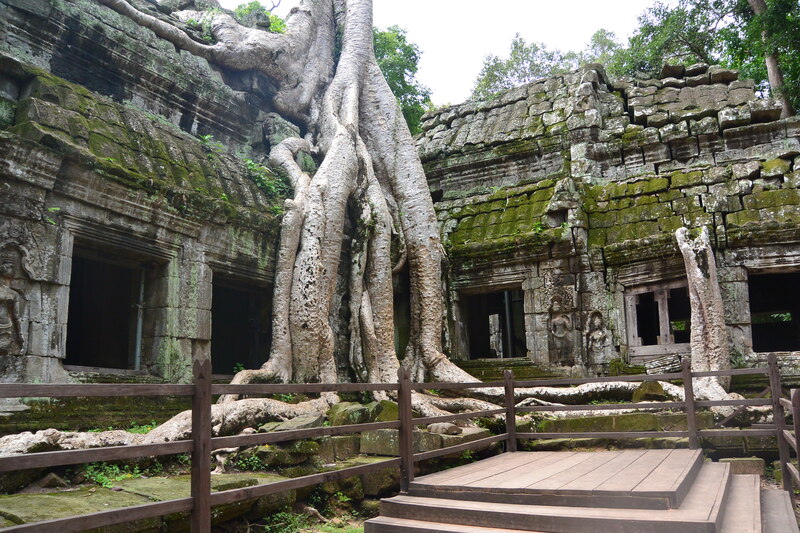 Angkor Wat wasn’t even my favourite out of all the Angkor temples (I would move into Ta Prohm if I could) but being there just reminded me that if you really want something, even if it takes a very long time, you can eventually make it happen. 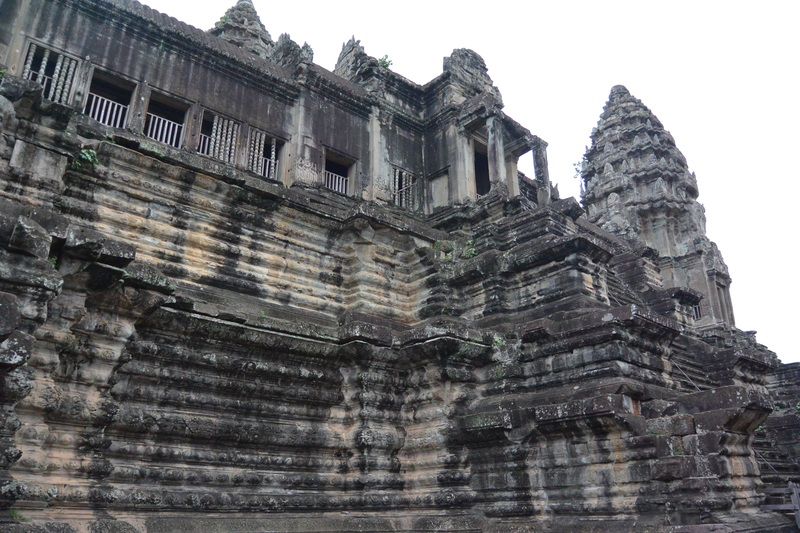 One tip if you are visiting Angkor, especially if you are only going to be there for one day, go to the ticket office around 5pm, right before it closes, the night before the day you are going and buy your ticket. 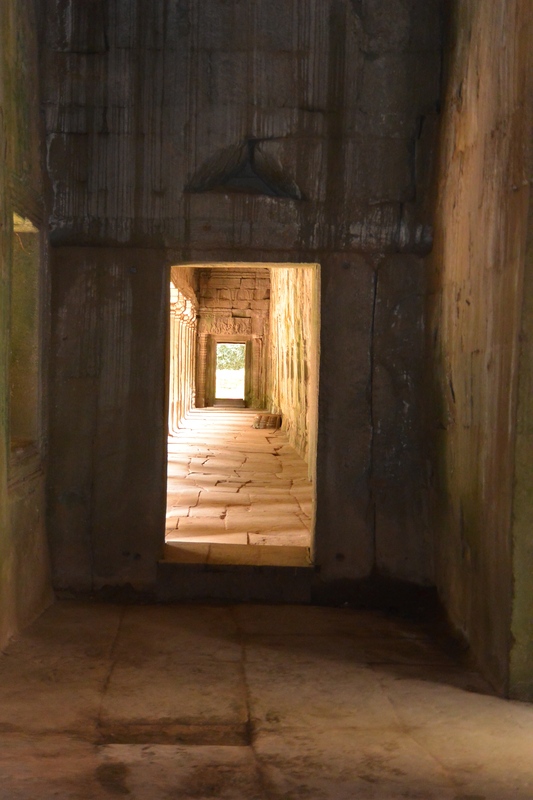 The ticket will get you into the temples for the rest of that day, so you can check out sunrise, there are a few good spots to watch it, and it is good for all day the next day, so you can get up early and get started without having to wait in line for a ticket in the morning.